The project OTEGO considers the solution of initial value problems (IVPs) of systems of ordinary differential equations (ODEs) by explicit methods. Since modern GPUs are highly parallel many-core processors aiming at a high computational throughput and also a high memory throughput, they are a promising architecture for accelerating numerical computations. However, the high performance of GPUs comes at the price of several caveats, such as high number of threads, small caches, and wide SIMD. Therefore, efficient implementations of numerical algorithms for GPUs require special optimizations. The KONWIHR project OTEGO aimed at the preparation of a DFG project of the same name, one major focus of which is the exploitation of specific properties of the ODE system and self-adaptivity. This includes the automatic selection of efficient implementation variants and the optimization of parameters, e.g., block sizes. 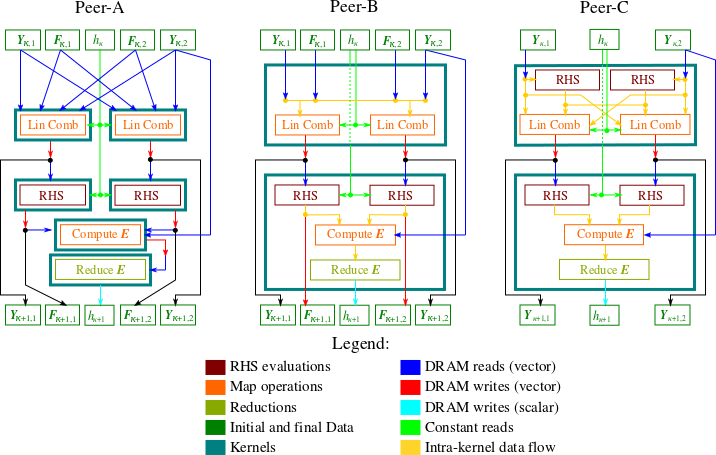 Since many large ODE problems are sparse and memory bound, one major challenge is the optimization of the locality of memory references, e.g., by identifying suitable mappings of computations to GPU kernels so that data reuse within kernels is increased. Due to the KONWIHR funding, a highly qualified master graduate could be recruited for the project, and additional work steps compared to the original research plan of the DFG proposal could be conducted. 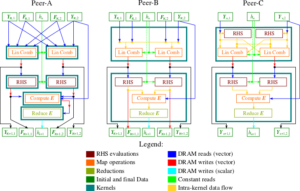 In particular, it was possible to develop and investigate a holistic, but initially labor intensive data flow graph approach for the automatic generation of program code which covers arbitrary explicit ODE methods. This provided an ideal starting point for the DFG project. KORCH , M. ; WERNER , T.: Accelerating explicit ODE methods on GPUs by kernel fusion. In: Concurrency and Computation: Practice and Experience (2017). – Zur Veröffentlichung eingereicht.